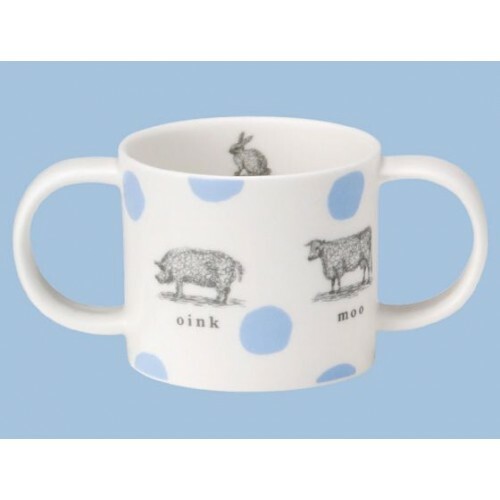 This contemporary bone china mug is decorated with beautiful vintage style illustrations of farmyard animals. Featuring a sheep, a chicken, a pig and a cow each with their respective animal sounds. A rabbit also appears on the inside of the mug. Repeat Repeat bone-china mugs are made the traditional way, starting with liquid clay poured into a mould by hand. The mug then goes through around 20 hand processes, as well as three firings in a kiln before it’s ready. Because they’re made by hand, their mugs may differ from each other very slightly, which we think adds to their charm and character. The quality is excellent, just as you would expect from bone china made in England.